The differences between glycemic index and glycemic load can be difficult to understand. But both are important to measure how your body processes sugar, which is important to your overall health. The glycemic index is a way to measure how 50 grams of carbohydrate of a certain food will cause your blood sugar levels to rise. The higher the number on the glycemic index (1-100), the more rapidly the carbohydrate is converted into sugar. Rapid glucose conversion is something you want to avoid, as your body performs best when sugar levels stay consistent. Although your brain and your body need glucose to function, too much too fast is not healthy. As your body processes glucose, your insulin levels rise in order to allow glucose to be delivered to your body’s cells which causes your blood sugar to return to a more normal level. When your body detects excess glucose, your pancreas secretes more insulin and the excess sugar is subsequently converted and stored as fat. To avoid a blood sugar spike, you should eat a diet heavier in low GI foods—foods that are between 0 and 55 on the GI scale—such as nuts, most vegetables, whole oats, and certain fruits. You can also incorporate medium GI foods—foods that are between 56 and 70 on the GI scale—such as, rice, whole wheat bread, and most fruits. Foods on the high end of the GI scale— over 71+, are typically heavy in starch and should be consumed minimally—such as white bread and potatoes. Frequently eating foods that cause your blood sugar levels to rise quickly will cause your body to store more fat. The glycemic index aims to help you avoid these foods. We cannot consider a food’s glycemic index without taking the glycemic load into account. 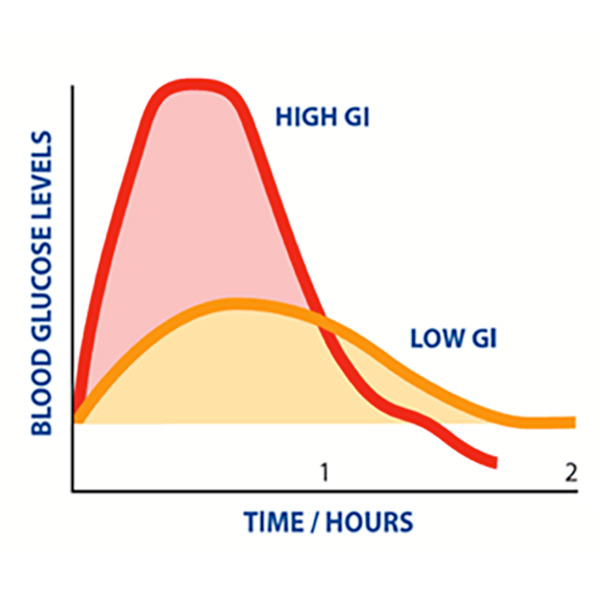 The glycemic load takes the glycemic index one step further and measures the rise in blood sugar based on the number of carbohydrates the food contains in an average serving. The glycemic load is calculated by taking a foods glycemic index, multiplying it by the carbohydrate content (measured in grams) and divided by 100. The glycemic load is actually more reliable than the glycemic index. As the video above explains, watermelon is a great example of this. The glycemic index of watermelon is 72, which is very high—meaning that is causing your body’s blood sugar levels to rise rapidly. However, watermelon is just that, mostly water. The glycemic load in a serving of watermelon is only 4, which is extremely low, as the carbohydrate content of watermelon is very small. So, while your blood sugar levels may rise quickly, they will not remain elevated for very long, as there is very little carbohydrate in watermelon. 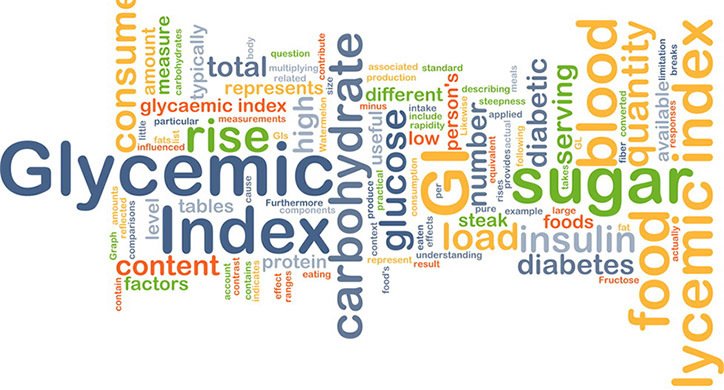 Remember the glycemic index looks at a 50 gram serving of carbohydrates for a specific food. The likelihood that you will consume 50 grams of watermelon is pretty unrealistic. The glycemic load, on the other hand, factors in how much of a specific food you would need to eat to obtain 50 grams of carbohydrate. One cup of watermelon, or 154 grams, has roughly 11.6 grams of carbohydrates, so you would need over 4x a single serving to reach the carbohydrate level that is measured in the glycemic index. When using the glycemic load as a reference for your food, keep in mind that foods between 10 and 20 on the glycemic load are considered moderate and will not keep your blood glucose levels elevated for long periods of time. Foods with a glycemic load higher than 20, however, should be eaten sporadically, as they will spike blood sugar levels and keep them elevated for longer. Having rapid spikes and consequential decreases will then will cause you to feel unsatiated and fatigued. The glycemic load more accurately measures how certain foods will impact your blood glucose levels by taking the number of carbohydrates in an average serving into account. If you’re wondering how fructose fits into this index, we hear you! It can be hard to talk about glucose without mentioning fructose—take a look at our sugar article! In this case, the fructose content in specific foods is not measured independently by the glycemic index or the glycemic load. Fructose is considered to be a low GI food, with a value of 19, meaning it causes less insulin secretion than glucose. Naturally occurring fructose is actually ranked lowest on the GI scale of all natural sugars. This is because fructose does not raise blood glucose levels, but rather blood fructose levels. Your body needs glucose for energy. High levels of fructose in your body, however, can cause cell damage— in fact, excess fructose in your body causes 7x more cell damage than excess glucose. This is another reason why you have to be careful when judging foods solely by their glycemic index value. Excess fructose consumption isn’t good for you, but its glycemic value is only 19. For a comprehensive list of foods glycemic index versus their glycemic load, we recommend you refer to the Harvard Medical School Index. The glycemic index ranks food from 1-100 based on how quickly they are digested and get into your bloodstream. The higher the food is ranked, the quicker it raises your blood glucose levels. The glycemic load, on the other hand, takes the amount of carbohydrates (in grams) in a single serving into account. By including the amount of carbs you are given a better sense of how your body is processing the serving. Glycemic load is more accurate than the glycemic index in predicting how your body will process sugar.